im 13 and i want trump to win. www.dogecoin.com give me money at the link. Telling people that trump is not racist and not moving all mexicans back to mexico he is only bringing ILLEGALS BACK. 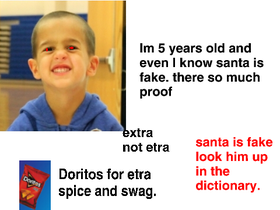 creepy kid proves santa is fake! 150 Dog Related Projects by June 2017!